A social work instructor describes supervision techniques for student interns that focus on creating solutions rather than examining problems. See if you can identify the solution-focused techniques in the following vignette between a student intern (S) and her field instructor (FI). S: I just don't understand why these clients don't listen to our advice. It would make both their lives and ours easier. FI: What would be different two months from now if they "listened" in the way you would prefer? S: Their lives would be less chaotic and I wouldn't feel so helpless. FI: So giving them advice is one way you've been trying to help. What other therapeutic options might we consider? S: I was thinking of asking them what they need from me at this point. S: I could ask the grandmother to come to a session. She seems to be the only reasonable person in this family. When she came one time, everyone seemed to be calmer. FI: Well as the saying goes, "if it works, do it again." You mentioned you feel helpless with them. Can you think of a time when you didn't feel helpless with them? S: Yes, when we were doing exercises. FI: So "doing" with them is more comfortable than "talking." Maybe you can describe more of what's going on when you are doing exercises. S: I don't know; they just aren't talking over each other. FI: I wonder if you might think about looking at the context more when things are going right and pointing it out as a form of reinforcement to them and a point of intervention for you. This example of a solution-focused approach presents a few of the multiple techniques used in supervision. By the end of this article, you will easily identify these techniques and be able to build more into the script. The solution-focused approach is a form of brief psychotherapy developed by social workers Insoo Berg and Steve De Shazer in the 1980s (Walsh, 2013). Originally it was used for helping people overcome addictions, but the approach was then applied successfully to other behavioral and emotional disorders. Now its principles are being adopted in the corporate world as a management approach. Ironically, instead of social service administrators borrowing concepts from the management world, the corporate world is now borrowing management concepts from the behavioral science world. Solution-focused approach is considered postmodern in that it is based on the social constructionist premise that people construct their own reality and know the solutions to their problems. The principles that undergird solution-focused approach emphasize competence, strength, and possibilities. The focus is on creating solutions rather than examining problems. What's the difference between problem solving and solution finding? Problem solving is limited to looking at one problem at a time. It looks at the past and the present. Solution finding resolves and prevents problems in the future. Developing a solution is not necessarily dependent on analyzing the problem; a more important aspect is analyzing exceptions to the problem ("exception finding"). • stop doing what isn't working and do something different. Solution-focused approach is famous for the miracle question: People are asked to imagine that a miracle happened while they were sleeping and the problem with which they were struggling was miraculously resolved. How would the person know the problem was resolved when she awoke? What would be different? This "miracle questioning" is modified in numerous ways in solution-focused supervision (Trenhaile). Solution-focused supervision may be one of the easiest and most useful approaches to foster clinical and professional growth. The approach can be used in two ways: as time-specific, over the length of a supervisory relationship, or as session-specific, in any one individual or group supervisory session. • "If you woke up tomorrow and by some miracle you were the confident worker/counselor you aspire to be, what would be the first thing you notice?" (a variant on the miracle question). The following are 15 solution-focused supervisory techniques with some illustrative examples (Thomas, 2013). • "What's going well this week?" • "What's the best thing that you did in your work since we last met?" • "Tell me about your cases. In what ways have you been successful? • "How did you manage to be successful?" • "Despite (______), how did you do it? Student: "Well, my client must have been in a good mood because she was more talkative this week." Supervisor: "It's not just that the client was more willing to talk. You did something to make that possible. What do you think that was?" Supervisor: "I wonder what's different during those times when you find the client is more talkative. What do you notice is happening at those times?" Supervisee: "I did notice she responds to my small talk and joking around. I guess she sees I'm human too." 3. Complimenting. Complimenting is a technique that can be done directly, indirectly, or self-reflectively. Identifying progress is an example of direct complimenting. For example, "You've been able to stay more focused in your sessions instead of concentrating on what to say next." Or, complimenting the social work student on professional skills: "One of your strengths is to always find strengths in your clients." Indirect complimenting involves speculation and engenders critical analysis. Workers are encouraged to find their own strengths. For example, "This client can be so unpredictable. How do you manage to stay calm during his outbursts?" Self-complimenting encourages reflection on the workers' experiences and the meanings of those experiences. Asking questions that probe their change processes, progress toward goals, and moments of pride allows reflections on events that are too often easily dismissed. 4. Scaling. Scaling is a tool used in a number of therapeutic modalities. Scales used in solution-focused supervision are to quantify a perception, a concern, or progress. For example, "On a scale from zero to 10, with zero being 'overwhelmed' and 10 being 'calm,' where were you when the client said she was suicidal?" Or, "You say we've talked this through enough and you feel confident you'd be calmer with the next suicidal client. How confident are you, from a scale of zero to 10, with 10 being 'completely confident'?" Scaling is also used to "scaffold" learning and growth. (Strong, Pyle, & Sutherland, 2009). For example, "On a scale of 0 to 10 with 10 being that you feel most confident to proceed with this case, where would you place yourself?" "What would it take for you to be at a __?" "What would be happening? What would it look like?" 5. Addressing the therapeutic relationship. Questions regarding the client-worker relationship stimulate speculation by worker and build empathy with the client. Some examples are: "What would the client say you could do to be more helpful?" "If I were to ask your client: 'On a scale of zero to 10, how helpful is your worker?' what would he say?" "On a scale of one to 10 how much progress would your client say she has made?" 6. Using silence. Silence allows time for the worker to ponder and consider possible responses. It's particularly useful when the supervisor gets "I don't know" responses from the worker. As in most situations, silence creates conversational pressure with attentive anticipation. It also makes the supervisee more accountable for his/her use of supervision and role models sitting with a client in silence. Worker: "I talk a lot during the session because the client doesn't talk at all!" Supervisor: "OK, so talking is one way. I wonder what else you could do the next time the client doesn't talk." Phrases such as, "It seems like …," "Could it be …?" "It sounds like …," "Perhaps …," "I am not sure …," or "I wonder …," and any other questions that are put forth with a tentative tone of voice maintains a not-knowing stance and facilitates collaboration. • "Suppose the client were to think your therapeutic relationship had improved. What might she notice you were doing differently?" • "Suppose everything worked out perfectly. What would you be doing then that you are not doing now?" • "What do you suppose the client appreciated most about what you did?" 9. Showing faith. This technique assumes that workers are doing the best they can. Assuming people have good intentions and giving the benefit of the doubt is another solution-focused technique. For example, a supervisor might ask: "So it may be that I am not totally seeing this situation from your perspective. You must have a very good reason to (____). Can you tell me what that is?" If the student/worker can't immediately identify a good reason, the question can be posed as "homework" to be discussed the next time. A solution can still be engendered without knowing motivating reasons for behavior. 10. Being future-focused. Focusing on the future is a cornerstone of solution-focused approach. Workers are usually vocal about what they don't want, but not as clear as to what they do want. The solution-focused supervisor will ask questions that identify what is desired in the future. These questions determine more than just not getting what the worker doesn't want which is focused on the past. The supervisor helps staff determine what they want in the future and then helps them decide how they can get it. 11. Metaphor, semaphore, and 'two-by-four.' The use of metaphor is usually fun. Describing one supervisee's reaction to a new restrictive policy at work, a supervisor said: "You're like a horse in the starting gate. I have an image of you chomping at the bit, with someone holding your reins back." In future sessions, when similar frustrations arose, the supervisee made chomping gestures. Semaphore is a signaling system using flags to represent letters. It's a coded message so the application to supervision might be making subtle suggestions or assigning homework to create a process of discovery. Thomas explains semaphore as less ambiguous than metaphor and less direct than instruction. Finally, the reference to using a two-by-four just means that sometimes, direct talk is needed. For example: "The reality is that you are a mandated reporter and there are no ifs, ands, or buts about it." 12. Dilemma talk ("what if …?"). This technique involves turning situations into dilemmas, thereby creating alternative solutions. Similar to the "what else" question previously discussed, this technique poses "what if" questions. For example: "What if this situation becomes known? There are some moral decisions involved. What are your thoughts?" 13. Promoting self-supervision. As students and workers become more confident, encouraging self-supervision is appropriate. Thomas refers to this approach as an internal check and balance. Questions might be along the lines of: "As you think about this later, consider what you might do next time;" or, "How could you continue to learn from this situation?" • "Are we on target?" • "What else could we do?" • "On a 10-point scale, with 10 being the best supervisory and learning experience you had envisioned, where would you place our work together?" • "What would have to happen to have it placed higher on the scale?" • "What did you get from our supervision today?" • "Did you get any tools today?" • "Is there another direction we should take? • "Am I missing something?" • "When do you feel your experience is valued?" • "Can you think of a time when you felt respected in supervision?" • "Has there ever been a time where you felt that I pushed my view over my own?" Reread the opening vignette. Does it make more sense? Can you identify, apply, and add some solution-focused techniques? 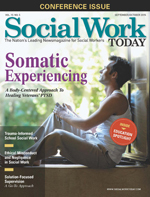 Solution-focused supervision is consistent with the strengths-based practice of social work. It's especially effective for work with students and novice workers. As a profession, we've progressed from the problem-solving model to the solution-finding model in both work with clients and practitioners. — Claudia J. Dewane, DEd, LCSW, is an associate professor of social work at Temple University in Philadelphia. Northwest Brief Therapy Training Center. Solution-focused management: Principles. Retrieved from http://www.nwbttc.com/sfmprin.html. Strong, T., Pyle, N. R., & Sutherland, O. (2009). Scaling questions: Asking and answering them in counselling. Counselling Psychology Quarterly, 22(2), 171–185. Thomas, F. N. (2013). Solution-focused supervision: A resource-oriented approach to developing clinical expertise. New York, NY: Springer. Trenhaile, J. (2005). Solution-focused supervision: Returning the focus to client goals. Journal of Family Psychotherapy, 16(1-2), 223-228. Walsh, J. (2013). Theories for direct social work practice. Belmont, CA: Thomson.